Another Day Unfolds in Bali. There is a calm urgency about my mornings in Bali. I’m keen to arrive at the beach a little before 6 am, drawn by the dawn but also by the anticipation of catching a sighting of Mt Agung on the horizon. When Guning Agung is in hiding, I admit I’m disappointed, and move along with my day a little more quickly. I head along the beach pathway in the direction of the cake lady’s stall, situated on the brick wall at Pantai Sindhu. You have to be early to buy her freshly made Dadar Gulung. All her special cakes have been snapped up by 7am. She is round and sweet, just like her cakes and greets me with Selamat Datang if I’ve been away for a while. If it’s her day off or if she has ceremony, I wander down the road to the Sindhu market to buy cakes there, along with a hand of bananas or a few mangoes. Indonesian cakes are light and sweet, and incorporate three main ingredients- sticky rice, coconut and coconut palm sugar, and come in an endless array of shapes, colours and textures. They are boiled, steamed, baked or fried, often enclosing a secret ooze of bean or palm syrup and are small enough to wolf down in two bites. I’m very fond of green cakes, a colour extracted from the Pandanus leaf and striped jelly cakes made from agar-agar. Today’s surprise package from a new lady at Pasar Sindhu. A triangular parcel, made from banana leaf, filled with a sweet mixture of black long grain sticky rice, boiled jaja, shredded fresh coconut and a generous drizzle of coconut palm sugar syrup. I did not share this wonderful concoction with anyone. Yesterday’s Pasar Sindhu was alive and more frantic than usual. By 6 am, motorbikes and trucks had filled the small carpark entrance. Something was going on and I had to find out. The rows were crowded with vendors of cakes, ceremonial nic nacs, chicken stalls and flowers: I could sense excitement and frenzy, that buzz that permeates markets before a big festivity, akin to the mad rush in Melbourne markets before Easter or Christmas. I sought out my friend Ketut: she runs a little kitchen ware stall at Pasar Sindhu and is a goldmine of information. Today, she informed me, was Tumpek Wayang. When Ketut mentioned Wayang, or puppets, I almost ran home to my books and internet, keen to find out more about the day and the ceremonies that would follow. Along the footpath and business doorways of Jalan Danau Tamblingan, I almost tripped over the elabourate displays of Canang Sari. Today’s floral offerings were completely different, much bigger than the usual little baskets, with rectangular bedding of palm leaves and another jagged edged leaf, as well as flowers. Each business had the same leafy arrangement- another mystery to uncode. Tumpek Wayang, occurring every six months, is a festival when puppeteers perform purification rites to purify their bodies both physically and mentally. It is also a day of the performing arts, when offerings may be made to musical instruments and dance equipment. On this day, puppeteers (Dalang) throughout the island will present offerings to their shadow puppets (wayang kulit) with the intention of honouring the Lord Iswara. The puppets are taken out of their cases to be blessed by their owners and placed as if an actual performance is being held. This ceremony is staged at the different temples, and is called Sapuh Leger. In short, this is the day of puppeters and the puppets themselves. I have profound memories of the puppeteers and Balinese shadow plays, Wayang Kulit, of old Bali. On our first trip to Bali in 1978, travelling then with two young children, aged 8 and 7, we set out at dusk on a horse and cart into the countryside to see this famous shadow play. The night was dark: no street lighting or electric lighting of any kind lit the streets or houses back then. The village was lit by kerosene lamps. On that occasion, we were the only Westerners in the village. Fortunately we were met by the local schoolteacher. He spoke English and kindly offered us some tea and green cakes – my love of Indonesian cakes began on that day. The Wayang Kulit stage was raised and broad, covered in a long stretched white sheet and back-lit by a flickering lamp. The exotic sounds of the gamelan orchestra tinkled through the night, as hundreds of villagers sat below the stage in the dark and watched in awe. We took our place in the audience as the puppets performed the Ramayana, a show that lasts for 6 hours or more, as we soon found out. At some point we realised that we needed to exit gracefully: carrying our sleepy children, we managed to find a horse and cart to take us back to our palm thatched losmen. Today’s Tumpek Wayang celebrations were in full swing by mid afternoon. As the amplified voice of the puppet master, exaggerated and theatrical, emanated loudly from the nearby temple, I wondered whether the voice I heard was that of a real working Dalang or a recording: there aren’t so many working Dalangs in Bali these days, ( in 1990 there were around 2-300 Dalangs but only 30 working Dalangs ¹) not because of any demise in tradition, but because the role of Dalang is a demanding one, requiring skill in story telling, improvisation, comedy, linguistic skill, religion, singing, music, orchestra direction, puppet making as well as stamina. As food stalls began to line the streets, groups slowly gathered, dressed in white and gold, the colours of purity, and walked towards the temple for the ceremony, due to start at 4.30 pm. Most days go like this in Bali. After 40 years of visiting, I’m still trying to fathom the mysteries and joys of Balinese Hinduism. Sunrise to sunset and the time in between may bring an afternoon ceremony, a seaside cremation, or a purification ritual. Read the signs and keep your senses alert to gongs, bells and gamelan, then ask the locals about the day’s events. If you wish to join in, or visit any temple or ceremony, you’ll need the right outfit- a top with sleeves, a traditional printed cotton sarong and a scarf tied around the waist. While Balinese women tend to wear a lace kabaya, it is acceptable for westerners to wear any other sleeved shirt or T-shirt. Balinese men go for the double sarong on ceremonial days and look extremely dashing. Western men need only learn to tie their sarong in the appropriate way, worn over shorts. ¹ For further reading on Balinese ceremony and culture, see Bali, Sekala &Niskala, Essays on Religion, Ritual and Art. Fred B. Eiseman, Jr. Tuttle Publishing 1990. A remarkable book and a must for lovers of Balinese culture. Posted on October 7, 2018 October 7, 2018 Author FrancescaCategories TravelTags Bali, Balinese cakes, ceremony, Dalang, Gunung Agung, hindu temples, Hinduism, Indonesia, Indonesian culture, Indonesian puppets, Pasar Sindhu, Ramayana, ritual, Sanur, sarong, Tumpek Wayang, Wayang Kulit22 Comments on Another Day Unfolds in Bali. Morning of the World: Balinese Dawn. The Sanur sea platforms are used for silent reflection, yoga, photography and lovers. Jukung glows copper at dawn. Posted on September 22, 2018 Author FrancescaCategories TravelTags Bali, Gunung Agung, Indonesia, Photography, Sanur, Travel14 Comments on Morning of the World: Balinese Dawn. Sanur, Bali. Food to Nourish a Jaded Soul. Sunday Greetings from Sanur, Bali. Today’s post is simply about food. No spiritual anecdotes, or canang sari, moody sunrises or colourful Balinese characters. Just a picture post tempting you with some earthly delights eaten under a shady umbrella in a simple warung by the sea. Cumi Pedas- a chilli hot stir fry of squid, peppers, and other vegetables. AU$6/ Warung Onah Oding. Smoky sate lillit. Pounded fish, coconut and lemongrass sate with a mid curry. AU$8/ Jepun,Sanur. Dadar Gulung. Served at the breakfast table. Palm Garden Sanur. Salak- Snake fruit from Wayan’s farm in Sideman. All photos taken on my Samsung 9+. Impressed with the performance of this phone camera, at least for food shots. Posted on September 16, 2018 September 16, 2018 Author FrancescaCategories Budget, Photography, TravelTags Bali, beach warung, cumi pedas, dadar gulung, Jepun restaurant, Odah Oning, prawns, salak, Sanur, sate lillit, Semawang, snake fruit, squid, udang19 Comments on Sanur, Bali. Food to Nourish a Jaded Soul. It was the sign on the little Warung that first caught my eye. The first item, Tipat Tahu Kantok, provided only one clue, Tahu (tofu), but the other elements remained a mystery. This was one Balinese dish I hadn’t come across before. I asked the gentle man standing near the warung about the word Tipat and he pointed out some little palm leaf baskets hanging inside the Warung. Obviously, Tipat was some form of sticky rice steamed in these little baskets: the other elements of the dish were yet to be revealed. The other menu items looked tasty too. Plecing is a tomato chilli sauce and came with aforementioned Tipat, Sayur sounded like a vegetarian dish, Rujak, a spicy fruit salad, and some drinks. What a perfect little menu for a tiny Warung by the sea. I returned the following day and met the delightful Witti, the cook and owner of this tiny new warung. We tried her tasty version of Tipat Tahu Cantok and began chatting. Witti has witnessed great change in Sanur over 58 years, most for the better. Witti has worked at the beach end of Segara Ayu, at the northern end of Sanur, since she was a girl. She regrets that she never went to school: in the 1960s, her parents didn’t consider school important and so she was taught to collect coconuts, make shell jewellery and so on. Of course Witti is literate and speaks three languages fluently as well as a smattering of other languages too. She learnt on the street and is a modern, well spoken Balinese woman, as sharp as a tac, happy and vibrant. Her own three children completed high school and now she proudly talks about her grandchildren and the soaring cost of education these days, a subject that all Indonesians worry about. The beautiful Witti cooks up some tasty treats. She remembers many aspects of life from the past quite vividly. She spoke of the day Mt Agung erupted. She was four years old at the time. That eruption was one of the largest and most devastating eruptions in Indonesia’s history, killing an estimated 1,100 – 1,500 people. Witti remembers crowding with others on the beach in the pitch darkness, as Mt Agung, looming on the horizon, spewed lava and fire into the air. She recalls the the rain of ash falling around her for days. As she spoke, I could see the terror of that childhood memory in her eyes. Another sad memory involved the loss of many of her siblings. She was one of 12 children, but due to poor sanitation and lack of doctors and medicine, five of her siblings died at a young age. Still, she followed this with a smile- imagine having Wayan, Made, Nyoman and Ketut ( the four Balinese names used in order of birth) repeated three times over. We all laughed together: yes, things have changed for the better. We also met Los, her older brother, who works along Segara Ayu at a little booth next door to Witti, offering information and selling tickets for the large boat tours further north. I am keen to chat further with Los about the old days, to see if, as a teenager, he remembers the chaos and horror of the civil war period that followed the earthquake in the 1960s, though most Balinese don’t want to talk of those times. Vibrant modern Balinese woman, Witti in her brand new warung. After we finished our Tipat, a tasty and extremely filling vegetarian dish resembling, in some ways, a gado-gado, Witti brought out a little plate of crispy fried Jackfruit, an unusual sweet taste sensation. Sweet and crispy, the batter was as light as tempura but golden in colour. We promised to return for breakfast the next day to try her crispy fried sweet potato, pineapple and banana, washed down with Bali black coffee. On other occasions, we simply popped in for a cold beer and peanuts. Witti cooks peanuts and garlic together and serves them hot and fresh on a large saucer. One Bintang beer, some fresh nuts, a good sunset and a chat: life is sweet. A Balinese Tipat Tahu Cantok is a common traditional Balinese dish that can be found almost anywhere in Bali. It’s made of mixed steamed vegetables (water lily, long beans and bean sprout) which are mixed with steamed rice cake( tipat) and fried tofu mixed with peanut sauce. The sauce is made from freshly fried whole un-skinned peanuts, garlic, white pepper, coriander, purple shallot, chili and fermented soy paste. Tipat Cantok can be found in local small Balinese warungs but is rarely found in big restaurants. Los’ dog, Chocolate, knows his way home after work. As a footnote to this post, Indonesians live with the fearful presence of volcanoes and earthquakes. With all that beauty and fertility comes disaster from time to time. Mt Agung continues to vent, there are still over 1,500 Balinese evacuees. Agung only tends to become news worthy in the Western press when it affects air traffic and the plight of the traveller. Meanwhile, we awake to the sad news of another earthquake, following one from 10 days ago, on the neighbouring island of Lombok. If you are looking for a reliable place to chip in a few dollars or euros for food and emergency supplies, follow the link below. If you have ever spent time in Lombok, or its Gili islands, you will appreciate how important this help is. Big or small, donations make a difference. Update: Thousands (22,000) local residents of Lombok residents are homeless and without aid. If 1000 readers of this blog donated $10, $10,000 would be raised to provide immediate relief by those volunteers on the ground. If you can’t donate, please share the following link to your social media networks. Posted on August 1, 2018 August 3, 2018 Author FrancescaCategories TravelTags Bali, designer clothes, designer store, fashion, Indonesia, Sanur, Sindhu Market, tailor, Travel14 Comments on Designer Clothing Outlet in Sanur, Bali. Balinese Cuisine at the Warung. Food, glorious food, glorious Balinese food. It’s one of the reasons I keep returning to this beautiful island. Good Balinese food is seductive yet quite subtle. Two famous Balinese sambals, sambal matah and sambal merah, add depth to a simple grilled fish or chicken, while the combination of white pepper and coriander seeds, turmeric and galangal, purple shallot, lemongrass, palm sugar, chilli, and terasi ( fish paste) are pounded together to make a rich tasting bumbu, or Balinese spice paste, the basis for a simple curry. 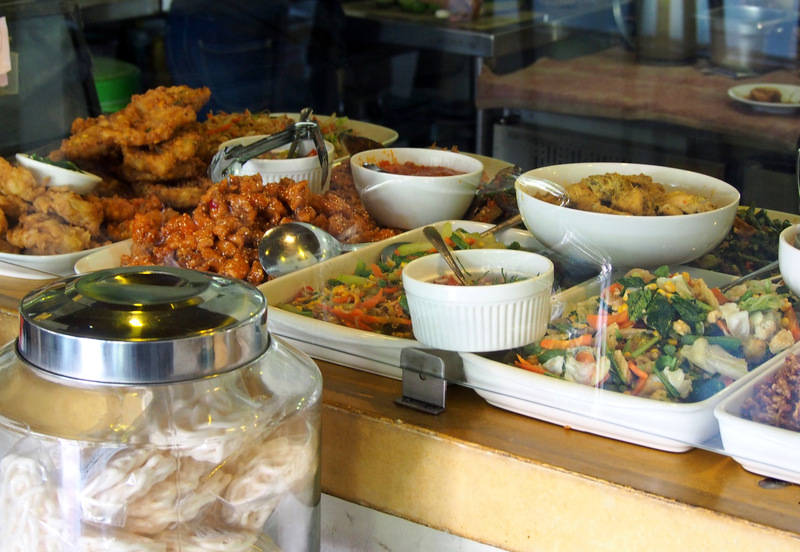 There are many tiers of eating establishments, or rumah makan, in Bali: you can pay a fortune at an upmarket international hotel, continuing to eat the cuisine from your home country, or watered down versions of local cuisine in a Western style restaurant, or you can try a more authentic and economical meal at a simple warung. A warung is a small family owned eating place, often located on the street or beach. Some may look a little ramshackle and temporary, often with small benches and plastic stools, and will usually be patronised by locals. Other modern warungs have sprung up in the beach suburbs around Sanur, but some bare no relationship to the real thing. Many warungs are made from wooden, bamboo or thatched materials, perhaps with tin walls. In the past, the Warung tenda, a portable warung that looked like a tent, was more common, with roofing and walls made from Chinese blue and white plastic tarps. Other interesting warungs include kitchen carts on wheels, colourful bright blue Bakso stalls, motorbikes with gas cookers, and night market warungs set up with little tables and chairs. Warungs also tend to specialise in one or two dishes which are often based on a secret family recipe. Morning bubur cart travels around the back suburban streets of Sanur, sounding a morning bell. Rice porridge comes with tasty toppings like ground peanuts. I’ll admit It takes a brave heart to venture into the tasty world of the street warung: you need to assess the cleanliness of these eateries and often that’s quite hard. Word of mouth, and popularity with locals- these are good indicators. Also check out the washing up facilities and water used. Good warungs are clean as hundreds of locals eat here every day. You may need to know a few food words, and simple phrases if you have special dietary preferences as often there’s no menu or price. Tanpa daging ( without meat) or tidak daging ( not meat) will suffice if you don’t eat meat. As food is often cooked to order, a warung cook is happy to adjust a recipe for you, leaving out ingredients that you don’t like. nasi campur, around $2.30 for rice and three selections. Warung Santai, a ‘westernised’ warung. Not all warungs are cheap: a few located around the Sanur beaches have become famous, rating highly on TA and frequented more by tourists than locals. One popular grilled fish restaurant, Amphibia, operates flat-out from midday till late. They work from a small tin shed, and grill the fish and seafood on a charcoal BBQ set up on raised platforms outside. Bench seating is nearby. You order your fish, lobster, prawns, octopus, squid and clams by weight, then they are barbecued and served with rice and vegetable urab and sambal. These boys never stop. They buy the fish early in the morning at Jimbaran, then store it under ice in large tanks: during lulls in business, you can watch them tenderising and peeling octopus, cleaning prawns and fish, running hoses around the place and stoking the BBQ with charcoal. A share plate of snapper, prawn, shrimp, a few calamari rings and razor clams is AU$20. Sit on a little stool on the beach and share the platter, washed down with a Bintang beer. Another Warung favoured by Westerners is Jackfish, a family run business right on the beach just past Semawang. Nyoman, the brains behind this warung, trained as a mechanical engineer but after working off shore for years, decided to open a fish themed Warung. His mother waits on tables and makes the Urab ( mild tasting Balinese salad made from bean shoots, green beans and coconut ). His father sorts cutlery and napkins and helps with the accounts. Nyoman does the grilling, waiting on tables and everything else. The family come from five generations of fishermen, and now source their daily deliveries from local sources. They often cater for large parties so check before hand as Jackfish closes when they do large groups. When I’m staying in the Semawang end of Sanur, I eat at Jackfish everyday, it’s that good. Grilled snapper, rice, urab, and two sambals. IDR 60,000/AU $6. Jackfish is located right on the sand at the southern end of Sanur. When in the mood for snacks, I head for warungs specialising in deep-fried foods, called Gorengun. 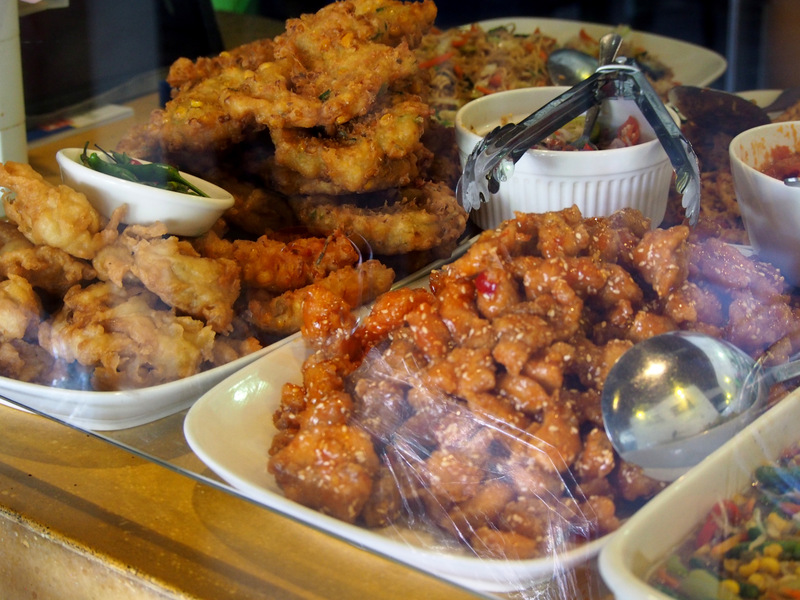 At these little carts you’ll find feep fried springrolls, deep-fried tofu or Tahu Isi ( Tofu stuffed with bean shoots) and battered gado-gado and other things with tofu, as well as an array of sweets such as Onde-Onde. A bag of 8 snacks will cost around AU$1 and will come with a few green chillies and chilli sauce. Tasty deep-fried vegetarian snacks from a Gorengan cart at the Sindhu Nightmarket, where a $1 goes a long way. The Warung situated right in front of the Bunjar Pantai Semawang, has great ocean views and is well sheltered from the wind. They do the best spring rolls in the district. Three large vegetable lumpia ( AU$1.50) make a tasty lunchtime snack. Try with a mug of hot lemon tea ( AU.65c) a fresh juice ( AU$1.50) or cut straight to the chase with a chilled Bintang to wash them down. Satu Bintang besar, dua gelas, Terima Kasih. Posted on July 31, 2018 August 1, 2018 Author FrancescaCategories Fish and Seafood, TravelTags Amphibia, Bali, Balinese cuisine, Balinese culture, banjar, budget travel, bumbu, gorengun, Indonesia, Jackfish, Sanur, semawang beach, sindhu beach, snacks, spices, street food, traditional, Travel, warung18 Comments on Balinese Cuisine at the Warung. It’s almost as if there are two Balis living side by side: sometimes they collide and intertwine, but most of the time, they exist in different time zones and spiritual planes. I’m always searching for the old Bali, or the other Bali, once the allure of warm swimming pools, unlimited breakfast banqueting and cheap trinkets begins to pale. The other Bali is always there: you can enter at any time just by going in the opposite direction, walking away from the tourist enclaves with their playgrounds full of bling and beer. Walk in the opposite direction, down concrete lanes and into local suburbs or onto the beach before the sun worshippers arrive, or into a hidden Pura ( Hindu temple) or an unassuming warung, a simple tin shed right on the sand for a coffee and a chat. Walking away might take you into the local Pasar (market) to buy a hand of bananas, or past a dozing grandmother, ancient, honey skinned and worn out, dressed in faded kabaya and brown ikat sarong, long silver hair wrapped turban style, curled up in sleep on the front porch, or past younger women, balancing enamel trays full of Canang Sari, flowers arranged in little palm leaf baskets, thoughtfully engrossed in prayer as they make their daily offerings to the gods and their ancestors. If you head to the beach at dawn in the hope of catching a glimpse of the holy mountain, Gunung Agung, on the horizon, you’ll find the dawn brigade, a busy uniformed crew of sweepers and cleaners, slowly but methodically removing leaves and rubbish, all signs of yesterday bagged up and taken away, the sand raked then watered down. This year marks an anniversary for me. I first came to Bali in 1978. Over the last forty years, Bali has changed enormously, and like all change, the blessings are mixed but much of it has been beneficial to the Balinese. During the next fortnight, I hope to relate some stories in the words of the locals, mostly on the theme of tradition and change, a topic close to my heart. Chatting to the locals comes easily: I’ll need a bit more bravado to seek permission for some portraits to accompany the stories. Morning offering, canang sari, by the sea. Soon to be washed away. I’ve been on the road for a few weeks now, the start of a long journey, and can happily say that I don’t miss my kitchen at all. Yesterday Mr T commented on the length of his fingernails, believing that they grow faster in the tropics. Mine are also long and white, but I suspect they’re flourishing due to the absence of work: my fingers and hands no longer plant, prune, dig, sow, pick, cut, peel, chop, grate, gather, sort, cook, stir, pour, knead, shape, or roll. My cooking and gardening hands are on holiday. Some one else is in the kitchen. This month’s post takes a look inside some Balinese kitchens and the food we have enjoyed along the way. The staff at Tirta Sari, Pemuteran, are multi skilled. One minute a waitress, next a basket maker. These little banana leaf baskets are used for sauce containers and rice. One of my favourite kitchens is Tirta Sari Bungalows, in Pemuteran, situated in the far north-west of Bali. I’ve stayed here before and I’m bound to return, just to relax and eat well. The food is traditional, Balinese, well priced and some of the best I’ve eaten in this tropical paradise. Each dish is beautifully presented on wooden plates, covered with banana leaves cut to size. The freshly made sauces, such as Sambal Matah, are served in small hand-made banana leaf baskets. The plates are embellished with flowers and dried ceremonial palm leaves and basket lids. These artistic flourishes connect the traveller to the role played by flowers in Balinese ritual and ceremony. Dining here comes with heightened sense of anticipation: guests are made to feel special. Staff peeling Bawang Merah and Bawang Putih ( shallots and garlic) for the evening’s fresh sambals. Do you know the legend of Bawang Merah and Bawang Putih? Preparing freshly caught Marlin for the grill. Tirta Sari, Pemuteran. You can tell a good Balinese restaurant by the authenticity of its sauces. Pungent and spicy traditional sauces and sambals are served in more modest warungs, while western styled restaurants serve industrial ketchup, believing that the Western palate cannot handle spiciness. 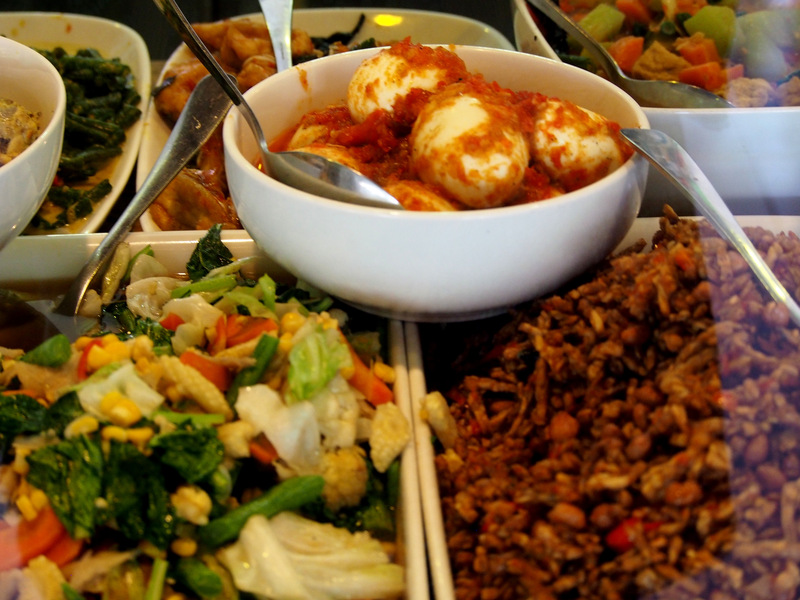 Balinese classic favourites include Nasi Goreng, Mie Goreng, Nasi Campur, Gado Gado, Urab, Pepes Ikan, and Sate. The best Gado Gado I tasted this year came from the kitchens of Lila Pantai. It disappeared before I snapped a photo. The Balinese version of this dish tends to be deconstructed and is often served with a little jug of peanut sauce on the side. A reliable source of Balinese recipes can be found in Janet DeNeefe’s Bali. The Food of My Island Home, a book that I refer to often when back in my own kitchen. Deconstructed Gado- Gado. The new shop right on the sea near the Banjar at the end of Jalan Kesuma Sari.Sanur, Ubud. Classic Nasi Goreng with grilled tempe sate sticks on side. Tasty version from Savannah Moon, Jalan Kajeng, Ubud. I am often amazed by the simplicity of Balinese kitchens. Many a meal is served from a mobile kitchen on the back of a motorbike, or from little yellow and green painted stalls, such as the popular Bakso stands, now seen only in the countryside. Classic sate with sides for a son-in-law. Many working Balinese grab some nasi campur for breakfast. Nasi campur is a serve of rice, often in the shape of a cone, surrounded by little portions of other dishes, perhaps some chicken, or tofu, some soupy, bland vegetable curry, a boiled egg or perhaps a corn fritter, all topped with a sprinkling of roasted peanuts and a serve of home-made sambal. Heavenly food. I love the vegetarian version of this dish. In the pasar, or fresh market, this meal is packed up for a traveller for around $1 or so, depending on how many sides you add. Every now and then, a traveller needs to lash out and eat Western food. In the past, eating Western cuisine in a Western looking place translated to high prices, bland food, poor quality and slow service. Things have improved, though it’s still much safer to eat in Balinese warungs and restaurants. Modern western cooking relies more on refrigeration, freezing and the pre-preparation of soups, sauces and various components. These ideas are quite foreign to Balinese chefs who prefer to make everything to order. The fish will be freshly caught, or purchased that morning from the Pasar Ikan at Jimbaran: the vegetables will not be pre-chopped, the stocks will be made on the spot. Unless a Western restaurant has an impeccable reputation for cooking and serving foreign food, they are best avoided. The Three Monkeys restaurant in Ubud is one place that gets it right. Mr T ordered a remarkable Italian/Balinese/Melbourne fusion dish- Saffron Tagliatelle with prawns, lemon, chilli and sambal matah. I found my fork sneaking over to his plate for a twirl or two. The tagliatelle was house made, the service was prompt, the level of spice just right. I had snapper and prawn spring rolls which were also sensational. Heavenly fusion food at Three Monkeys, Ubud. Another very reliable western style restaurant in Sanur is Massimo’s Ristorante. This year, guests may watch the girls making fresh pasta down the back of the shop. Massimo has also introduced fresh buffalo mozzarella and burrata to the menu, which is now made on the island. Vanilla Stick Lady in The Pasar Sindhu Market. Many thanks to Sherry for hosting this monthly series. My kitchen posts will be on tour for four months and one of these days, I might get my hands dirty again. A collection of well used Ulegs outside Janet de Neefe’s cooking school, Honeymoon Guesthouse, Ubud. Next post. Return to Chiang Mai, Thailand. The sound of gamelan moves closer, an exotic percussion that is repetitive and hypnotic, as we wake from our afternoon slumber and follow the procession down to the sea. Another Balinese ceremony is about to take place. White dressing for the last funeral stage, Memukur. Sanur, Bali. The Balinese will often tell you that they won’t be around for a few days as they have a ceremony to attend. Religious and family ceremonies are an important part of the fabric of Balinese life. Hindu ritual and observance is strictly upheld, despite the massive level of tourism in southern Bali. Balinese often return to their family village in the country for these events: they are always in touch with the ever shifting Hindu calendar. I’m forever asking questions, trying to fathom the significance of each new ceremony that I come across. Memukur is a traditional Balinese ceremony for the passed away spirit. The purpose of this ceremony is to purify the spirit to send it off into reincarnation. It must be purified by water so it may return to heaven to begin the process of reincarnation. According to tradition, the deceased returns to human life in the form of the next born family member after these rituals. White is the colour worn during Memukur, with bright sashes and golden sarongs for the women, and white shirts and traditional dark sarongs for the men. The carefully tied udeng is worn as a hat on these occasions. Ceremonial dress, men wearing the udeng. The assembled group wait patiently for the priest to arrive, who performs the water purification ceremony. This is not a sad occasion yet the gathered are quiet and respectful. Some of the younger boys in the gamelan band joke quietly together: young women occasionally glance at their mobile phones. A collective sigh can be heard as the elderly priest arrives in a black car and slowly moves to the raised platform to perform the purification rites. The gamelan orchestra begins again, with increasing percussion from gongs and hammered xylophones and background wind instruments. The Balinese don’t mind foreigners witnessing these ceremonies. Some points of etiquette need to be observed. Do not walk in front of people when they are praying. Do not use flash or point your camera at the priest’s face. Never sit higher than the priest, the offerings and/or people praying. During cremation ceremonies, never get in the way of attendees. Stand at a respectable distance, somewhere along the sides or in the background. The bikini clad and shirtless should stay well away. It’s not unusual for the assembled to be happy at this final stage of a funeral process.